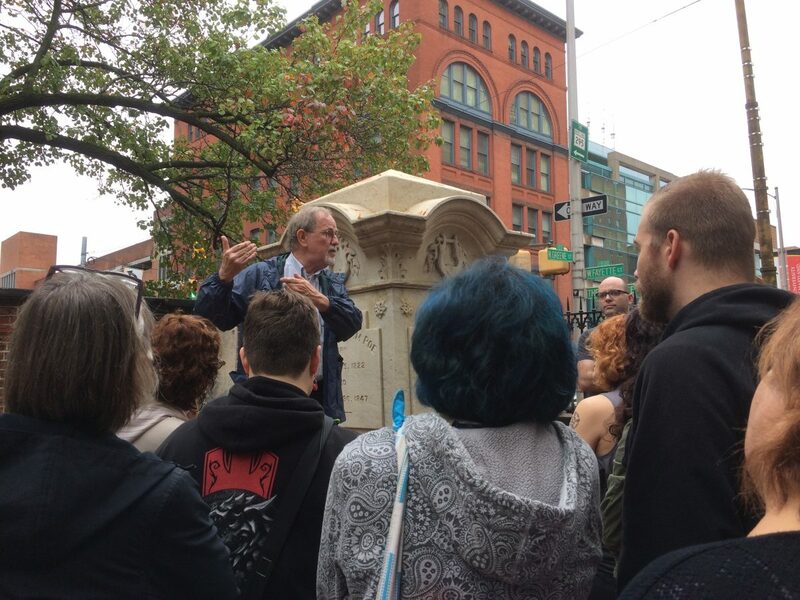 “When I was first approached by Doors Open Baltimore to include the tour of the Westminster Hall, Burying Grounds and Catacombs in their event, I jumped at the chance because I’ve been here many years and I enjoy sharing my knowledge of this site. It has so many famous people: Edgar Allan Poe and famous patriots. People love this cemetery and they love the catacombs. I saw it as a chance to make people aware of this site and so maybe they will come back and visit it again when they are in Baltimore,” says Jeff Jerome, tour guide of Doors Open Baltimore’s Westminster Hall Burying Grounds & Catacombs tour. Associated with the Westminster Hall and burial grounds since 1976, Jeff is also the former curator of the Poe House and Museum. His revealed that his interest in Edgar Allan Poe first began when he was a young boy who would sneak to go see the old Vincent Price and Roger Corman films in the early 1960’s.